I'm pretty sure this ranks with the simplest side dishes of all times. 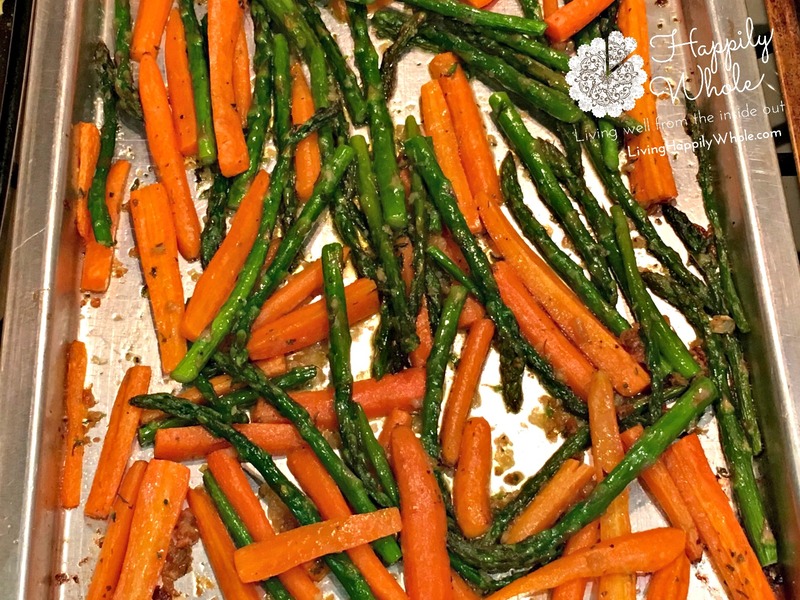 Garlic-n-Ghee Roasted Carrots and Asparagus. Knowing it’s packed with loads of Beta Carotene, Thiamin, Niacin, Vitamin B6, Folate and Manganese, Copper, Selenium, dietary Fiber, Vitamin A, Vitamin C, Vitamin K and Potassium makes it all the better. That's quite a list of nutrients, isn't it? And if you choose to get adventurous by including other colors, the variety of phytochemicals of will increase exponentially. You see, God did this really cool thing. He hand placed healthy plant-based chemicals (also known as phytochemicals) into each variety of edible plant. The combination of these lovely little chemicals in each of nature’s plants work together uniquely and is represented by their color category. So, a red pepper contains a unique combination of nutrients which, when you eat one, work together inside of you to bless you with health benefits only RED peppers can give you. Other red fruits and vegetables contain similar nutrient profiles (although not identical) played out in their visible color. Blue hues, shades of yellow, orange tones and varieties of green all possess their own unique combinations of phyto-nutrients that work SYNERGISTICALLY together in your body to bless you with benefits like cancer fighting, energy, metabolic boosts, diabetes prevention, heart health and more. God knew we’d need all those combinations that could attend to different bodily benefits. And He orchestrated it all to appeal to our eyes and palates with vibrant colors and various flavors. Cool, right!? You can’t accomplish anything like that by popping a pill manufactured in some lab! That’s why REAL FOODS is where it’s at. So anyways, back to my oranges and greens for this simple little side dish. I chose carrots and asparagus for no other reason than I’d bought them from the store and if I waited any longer to use them up, I might lose those phytonutrients to mold. I set them on the counter and stared, considering my family and what they might like. Butter! They love butter….the real stuff. I love it too! In fact, most days I estimate I eat about two tablespoons of real, grass-fed butter between my topping my English muffin, my sweet potato and any other random way I can incorporate it. (Why grass-fed? Because butter from cows who eat grass is far superior to butter coming from those poor cows stuck in stalls consuming GMO corn feed. Think about this: You are what you eat eats. And cows were meant to graze on natural grass. So those eating the way they were created to eat produce healthier products. Got it?) Now, for this recipe, I chose to use GHEE (see recipe notes) instead of a stick of butter because if grass-fed butter is good for you, ghee is even better. Plus, when phytonutrients in fruits and vegetables are consumed with some fat, our bodies can more easily access them. So, I often try to eat some good fat with those vibrant colors. There you have it. 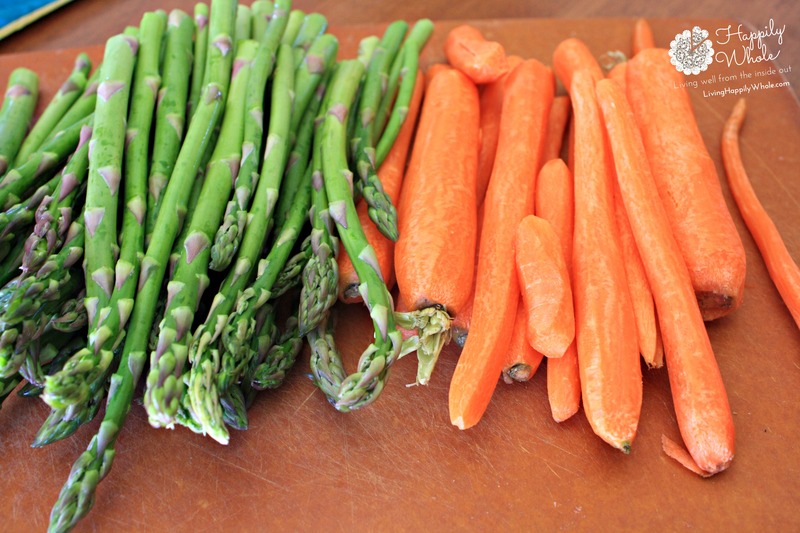 A little cliff-notes lesson on consuming colors and how my carrots and asparagus got smothered in butter for one of the simplest side dishes ever! Now, my suggestion to you as you consider what veggies you’ll roast up: When you’re at the store, stock up on ALL the colors of the rainbow! Grease a large baking sheet with cooking spray; set aside. I used a jelly roll pan. 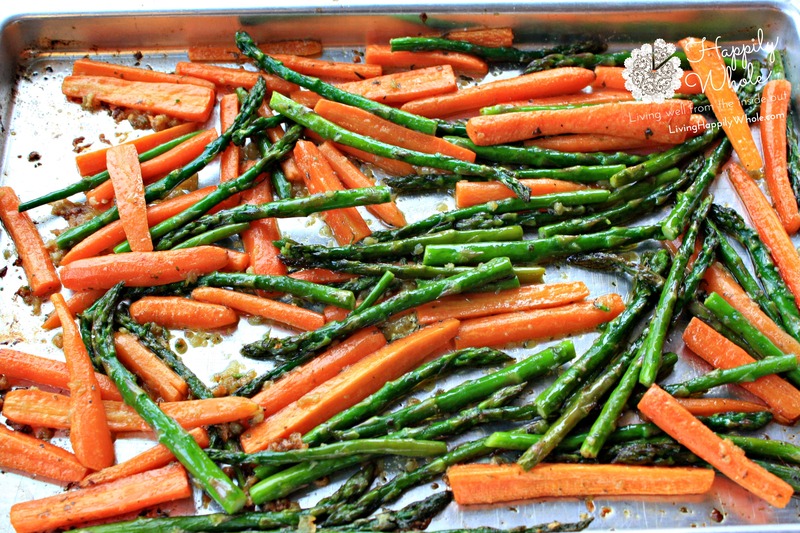 Wash your carrots and asparagus (or whatever you chose to roast). Peel and slice carrots. Slice the fat ones long ways also. Break the tough ends off the asparagus and cut to a similar length as your carrots. 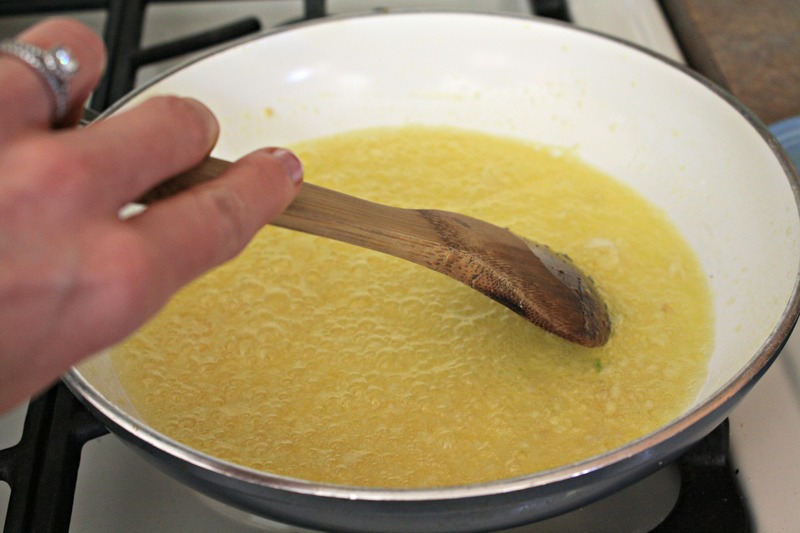 Melt ghee (or butter) over medium-heat in a large skillet. Add garlic and cook for about 3 minutes, or until lightly browned, stirring very frequently. DO NOT burn the garlic. Toss the veggies with the garlic butter either in the pan or pour the butter over them in a mixing bowl. Toss until well combined and all the veggies are smothered. Transfer veggies to previously prepared baking sheet. Arrange in one layer and bake for 15 to 20 minutes. Remove from oven, turn, and bake about 10 more minutes or until you can pierce them with a fork. Remove from oven and transfer to a serving plate. Sprinkle with salt and pepper and adjust accordingly for your taste. Optional: Garnish with fresh chopped parsley. *Ghee is also known as clarified butter. It is made from real butter. Real butter contains milk fats and moisture. Ghee is pure butterfat cooked longer, until all moisture is removed and the milk solids are caramelized and then filtered out. Lots of experts think it's healthier and more easily digested.